Betsey Johnson makes a reappearance in the season 5 episode 6 of Buffy the Vampire Slayer. 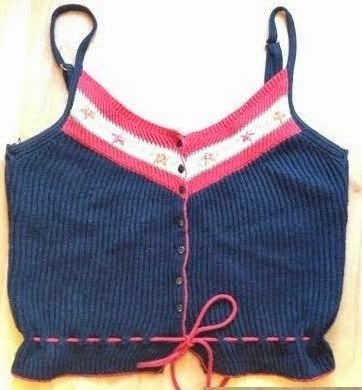 The adorable knit tank top, that Anya wears, is by the designer. "Thank you for coming. We value your patronage. Please come again for more purchases!" I love the Betsey Johnson top that Anya wore. I am amazed you found it in another episode, too! You have the best search skills ever. Thank you! It's mostly luck lol. I've read a few articles with interviews with Btvs costume designer Cynthia Bergstrom in which she mentions her favorite Designers for the show. That has given me an idea of wear to look. That and having a photographic memory, for all things Buffy fashion related, has helped in identifying pieces that I notice on sites like Ebay haha. You are incredible! I have read some articles that had interviews with Cynthia Bergstrom, but I don't have a photographic memory. I will see something I THINK looks like a Buffy shirt, but can't be sure til I see the episode just by chance. I have to write everything down and I only have a few finds. Yours are awesome!